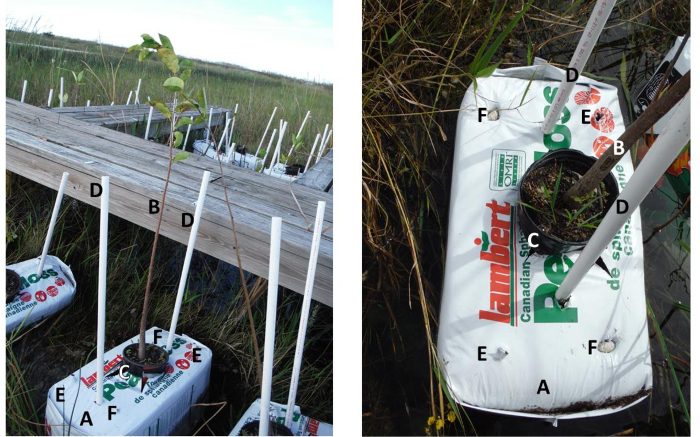 This protocol describes a simple, cost-effective tree planting technique for restoring degraded Everglades tree islands that experience inundation. The design creates an island (pop-up) which floats initially and adds elevation to promote tree survival and growth under flooded conditions. Dreschel, T. W., Cline, E. A. 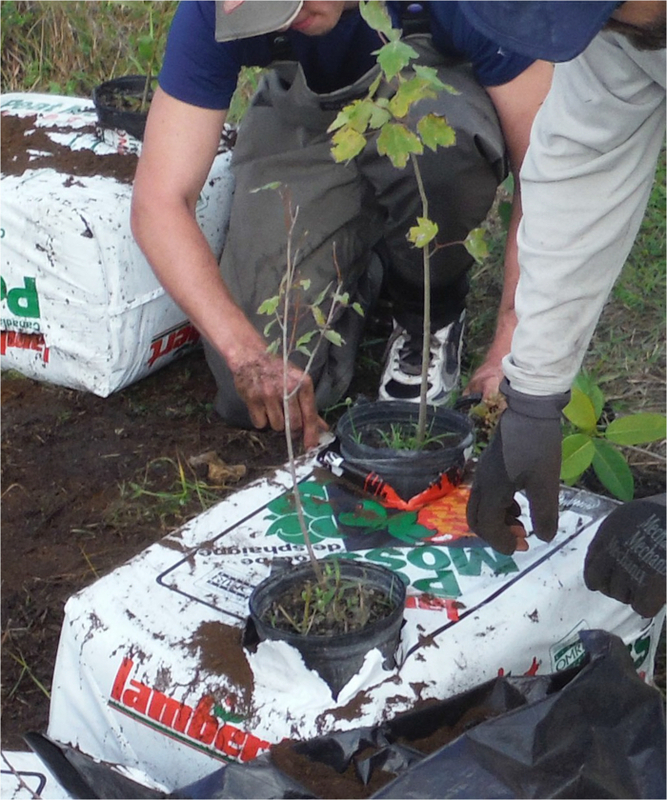 A Simple Planting Technique for Re-establishing Trees Where Frequent Inundation Occurs. J. Vis. Exp. (131), e56636, doi:10.3791/56636 (2018). Many of the Everglades tree islands have lost elevation over the past century and most of their trees have died such that they are now covered with herbaceous plants. This protocol describes a simple, cost-effective tree planting technique needed for restoring degraded Everglade tree islands. The design is patterned after a natural Everglades process that creates floating peat islands, which allows tree survival and growth in flooded conditions and often leads to the development of tree islands. Commercially available peat bags were used as the medium for the growth and establishment of potted native tree saplings. The pop-up configuration floated initially and provided additional elevation to minimize inundation, with a single native tree species sapling and a single tree fertilizer spike. During a 3 year study involving 105 pop-ups, most plants survived (80%) and many thrived. Determining whether this technique can establish trees on a degraded tree island will require longer studies and extensive field tests. Natural recolonization of degraded Everglade tree islands by native tree species is possible through seed dispersal if there are nearby islands with a diversity of tree species1,2. According to Sklar and van der Valk1 restoring severely subsided tree islands may be possible, "by raising the elevation of their heads, although such efforts would be expensive and labor intensive." Currently, there are very few native (desirable) trees present near the degraded (also known as "ghost") tree islands in Everglades Water Conservation Area (WCA)-2A (one of five WCAs created to store water for and prevent flooding of surrounding urban and agricultural areas) to provide the seeds needed for recolonizing the degraded tree islands3. To raise the elevation of a subsided tree island for reforestation, appropriate fill would have to be transported to the island. This would require building roads for trucks or creating waterways for barges, leading to severe damage to the Everglades at a great financial cost. A simple, low cost technique is needed to repopulate degraded tree islands with native tree species that will provide elevation (reduce hydroperiod) and improve survival under the variable hydrology endemic to the Everglades4. The size of these pop-ups allows the ease of transportation to the planting site. This provides an advantage compared to conventional filling of areas and planting of trees which may require roads be built for transporting. This technique thus reduces the ecological impact of tree planting activity. Additionally, these pop-ups have the ability to float for the initial six months following deployment, to allow establishment of the sapling. Under conventional tree planting scenarios, the trees may experience increased flooding stress during establishment if water levels rise. A number of designs were tested and it was determined that greater pop-up height (bag orientation), one tree fertilizer spike to add nutrients, and planting the pop-up with a single sapling achieved the best configuration for deployment upon an Everglade degraded tree island4. Although other researchers describe the planting of trees for restoring forested wetland areas5,6, to our knowledge, none of the planting techniques described added elevation to reduce hydroperiod. This procedure mimics the formation of floating Everglades tree islands that arise from peat that breaks away from the bedrock and floats to the surface. Upland plants can establish to form a "pop-up" or floating tree island which eventually moves and settles onto the peat surface and becomes what is termed a "battery" tree island1,7. Everglades tree island tree species have varying tolerances to flooding for growth and survival8,9,10. 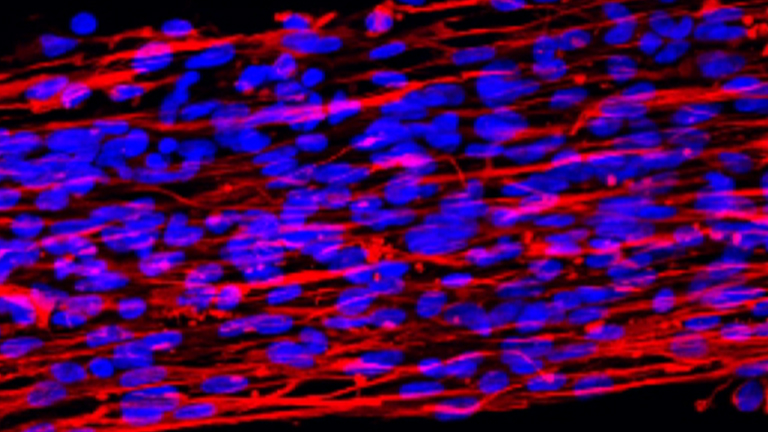 In a controlled study, Jones et al. demonstrated the importance of the hydroperiod to the survival of Everglades tree island species9. Stoffella et al. found that relative elevation (to the water surface) had varying and profound effects on planted native tree species survival and growth, due to the specific tolerance of each species to flooding10. Tree species can be selected for the specific conditions present. The tree planting technique described here can provide additional elevation and consequently, tree seed sources in formerly forested regions that have lost elevation and are now subject to an inundation environment that is harmful to native tree species. Formerly forested regions that experience extended hydroperiods might benefit from this method to reintroduce woody species to these areas. This technique provides elevation, thus reducing the hydroperiod. In addition, the trees will build soil (root and leaf biomass) and provide a seed source for continued colonization of the area. Obtain 2 or 3 gal (7 or 11 L) saplings of locally grown native trees (in plastic pots), commercial peat bags (measuring 0.3 x 0.46 x 0.6 m3), tree and shrub fertilizer spikes, duct tape, polyvinyl chloride (PVC) pipe (2 to 3 m length, 0.8 in (2.1 cm) diameter, schedule 40), box cutter, trash bags, and a metal rod or rebar (1 to 2 m in length, 1.3 cm diameter) to puncture the peat bags. Potential tree species applicable to the Everglades are Annona glabra, Ficus aurea, and Acer rubrum. Wearing work gloves is highly recommended. 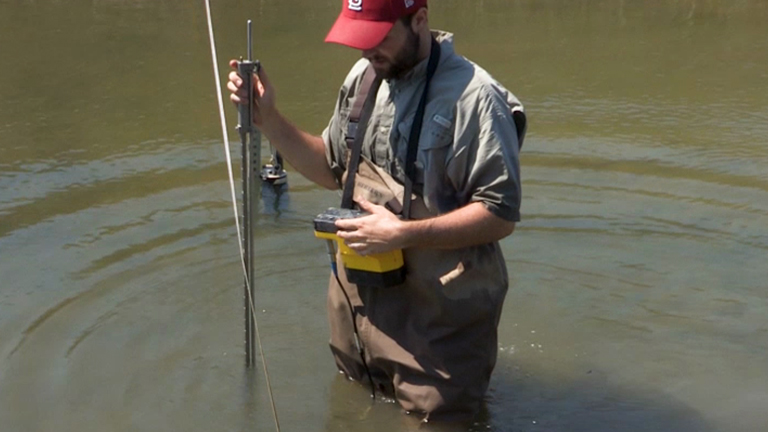 Determine the best location to deploy the pop-ups, typically in a high area of the ghost tree island with at least 0.3 m of peat remaining above the bedrock where inundation would be minimized during the wet season. Transport saplings, commercial peat bags (one per sapling), tree and shrub fertilizer spikes (one per sapling), duct tape (number of rolls as appropriate), PVC pipe (two per sapling), and other tools and materials to the planting location (typically by airboat). Slide the plastic pot off the sapling roots and pot soil, and cut a large hole in the pot bottom, or remove the entire bottom of each sapling pot using a box cutter or scissors (Figure 1). Slide the pot with the open bottom back onto the sapling roots and pot soil for insertion into the peat bag. Make a 20 to 30 cm X-shaped cut (slightly larger than the pot diameter) in the peat bag at the center of what will be the upper surface, using a box cutter. Remove about 2,000 to 5,000 cm3 (about one-half the volume of the pot) of the contents of the peat bag from the X-shaped opening and place in a trash bag for removal. Set the bottomless pot with the sapling within the X-shaped opening/depression created by removing the peat from the peat bag. The bottomless pot should be about halfway down in the X-shaped opening, with the points (triangles) pointing up against the sides of the pot (Figure 2). The saplings are left in the pots to provide additional elevation and physical support. Secure the pot in place with several windings of duct tape, around the pot and covering the bag triangles. This will affix the bag triangles to the pot (Figure 3) and hold the pot in place during the next 2-3 years of growth. This creates the pop-up. Set the pop-up in the water. Enter the water and move the floating pop-up to the planting site. Tether the pop-up in place with two approximately 2 to 3 m long lengths of PVC pipe inserted through the bag on either side of the sapling, into approximately one-third to one-half m of the substrate (soil beneath the bag) (Figure 3). Puncture the bags on the top, bottom, and sides by driving the metal rod (rebar) completely through the bag, creating openings (at least four in the top/bottom and four in each side) to allow water to enter and to allow the roots to emerge (Figure 3). The pop-ups will float for about 6 months. Insert one tree fertilizer spike entirely into the top of the bag in one of the locations shown in Figure 3. Return to the site as frequently as deemed necessary, particularly following severe storm events and note the condition and survival, and measure the tree height and basal diameter of each remaining tree on an annual basis. After 3 years, return to the site with box cutters/scissors and trash bags to remove the pots and plastic from the peat bag and recycle them. The pot and plastic from the bag (top and sides) are readily removed without disturbing the sapling; the plastic beneath the peat bag may not be accessible (Figure 4). Return to the site on an annual basis to evaluate survival and growth. The study using this technique4 was conducted within a 0.32 km2 Everglades physical model11, on a ridge to simulate testing on a ghost tree island. During this study, two bag orientations for height (low: 0.3 m, high: 0.46 m), with one versus two saplings per bag growing, were tested as well as the use of tree fertilizer spikes to promote survival and growth. Three species of saplings were used: A. glabra, F. aurea, and A. rubrum. For each species, 5 replicates of 4 treatments and 2 sets of controls were planted for a total of 35 individuals of each specie. Most of the saplings grown in the study survived and thrived, with growth dependent upon the treatment4. Survival rate was 80%, with 18 F. aurea and 3 A. glabra found dead at the end of the 3 year study. Results indicate that the simplest and most effective configuration has a single sapling and provides the higher profile of 0.46 m (greater height, less flooding), with one fertilizer spike, and without additional flotation. Since the daily growth rate in double planted bags was less than the control, this treatment should not be used4. The reduction in growth by saplings receiving two fertilizer spikes as opposed to a single spike may be attributed to over-fertilization. Over-fertilization has been suggested as causing poor growth by altering soil chemistry and the soil microbial community, as well as leading to poor root establishment and reduced water absorption12. Sapling basal diameter data for the high-profile peat bag orientation yielded a statistically significant treatment effect as well as a statistically significant difference between the low fertilizer treatment data compared to the controls and compared to the high fertilizer treatment4. The surface of the soil in the pots and the punctures in the top surface of the peat bags provided sites for the colonization of herbaceous plants and ferns over the time of the study4 (Figure 4). In addition, willow trees (Salix caroliniana) invaded several of the pop-ups as well. The saplings responded to the treatments generally as predicted. The fertilized trees generally were the most successful (and the one spike treatment was even better), followed by the controls (single planting), the flotation treatment, and double planting (no statistically significant effects)4. Figure 1: Photograph of removal of the sapling pot bottom. 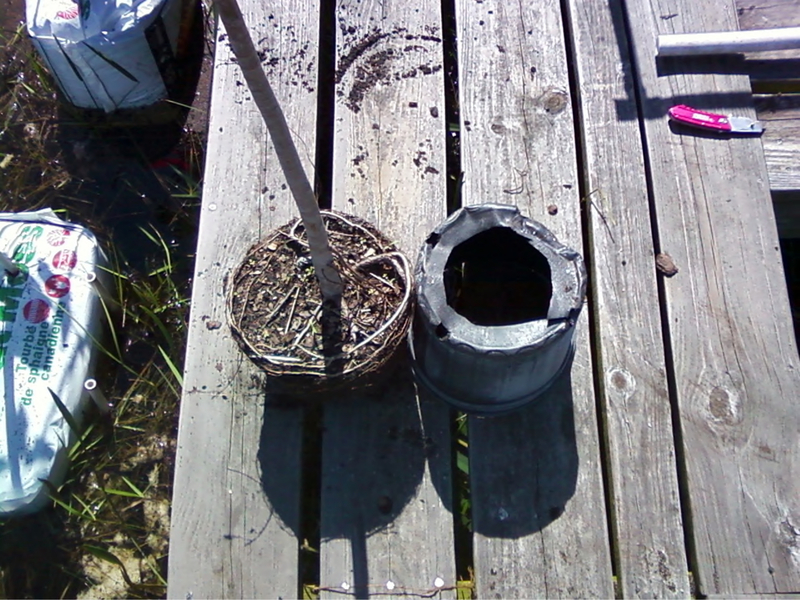 The sapling roots and soil are removed from the plastic pot and a large portion (or the complete bottom) of the pot bottom is removed with a box cutter. The pot is then replaced over the roots and soil. All photographs are courtesy of the South Florida Water Management District. Please click here to view a larger version of this figure. Figure 2: Insertion of bottomless sapling pot into the peat bags, with cut triangles shown on the sides. The photograph shows a bag with two pots inserted although the preferred method was determined to be one pot per bag. The bag shown also is in the low-profile configuration, which is not the preferred orientation. For the preferred final orientation, refer to Figure 3. Please click here to view a larger version of this figure. 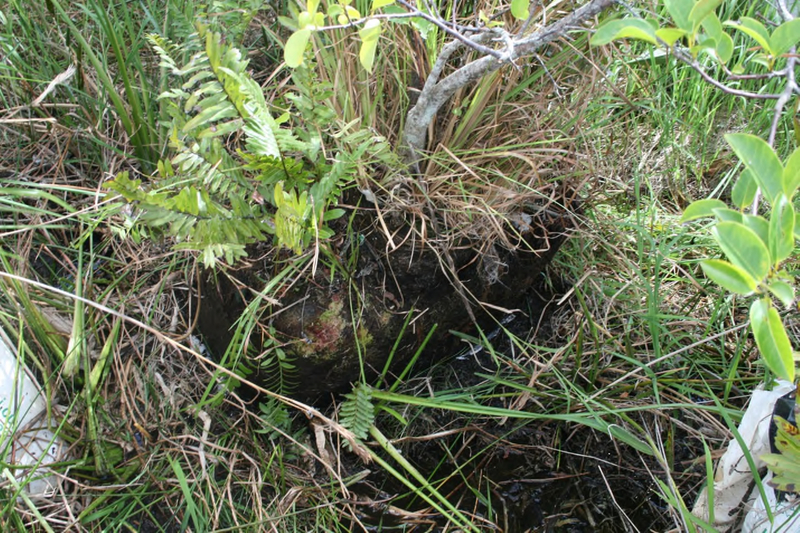 Figure 3: Photographs of an A.glabra sapling with the bottomless pot duct-taped to the peat bag soon after deployment. Complete pop-up shown floating in place on the left; closer view shown on the right. (Labels) A: peat bag; B: potted sapling; C: duct tape around pot to hold in place; D: PVC pipe tethers; E: holes made by inserting a metal rod; F: fertilizer spikes (the two-spike treatment is shown, however, adding only one spike is recommended). Please click here to view a larger version of this figure. Figure 4: Photograph of a pop-up following pot and bag removal. Peat from the bag and the pot soil are now held together by the roots which have also grown down into the substrate. Note the fern and other plants that have colonized the mound of peat remaining from the pop-up. Please click here to view a larger version of this figure. This proposed approach to replanting tree islands allows the increase in elevation and deployment of trees from an airboat without the building of roads required to bring fill to each site. This minimizes the cost and disturbance of implementing tree island plantings. An issue with this technique is the aesthetic and environmental problems associated with putting a large quantity of PVC pipe, plastic bags, and plastic pots on a marsh feature that was once a tree island. The current approach is to remove the plastics after a sufficient period of tree establishment (approximately 3 years) and properly dispose of or recycle the plastic debris. Another possible solution to the plastics issue is to utilize biodegradable materials for the tethers (wooden or bamboo poles), pots (peat pots), and peat bags (burlap or a similar material) with the intent that the containment material would maintain integrity and contain the soil and peat until the tree sapling was established in place. Since the purpose of this study was to demonstrate the proof-of-concept and to keep the cost reasonable, the original containers of the trees and peat were modified for use in this study. This allowed for the implementation of a basic study in which the container materials were likely to maintain integrity for the duration of tree establishment. We have observed that some of the bags began to split apart after about 30 months following deployment. Removal of the plastics should take place when this is first observed to avoid plastic waste floating away. Preliminary observations following the removal of the plastics from some of the pop-ups after about 32 months indicate that the roots of many of the saplings and of the other plants colonizing the peat bags can maintain the consolidation of the peat and thus the elevation provided solely by the peat and pot soil at deployment (Figure 4). We demonstrated a promising technique for planting trees in regions of limited access and variable hydrology at a retail cost of less than 20 USD (sapling = 3-4 USD, peat bag = 11 USD, other materials = 2-3 USD) per pop-up. This technique will work best in peat or organic soil-based regions with a potential to restore forested areas. We developed the technique with the goal of restoring degraded tree islands in the Everglades but it could readily be adapted to other environments with similar restoration goals. This work was performed under funding and oversight of the South Florida Water Management District, an agency of the state of Florida. Florida enjoys a broad public records law. This document is subject to that law and considered to be part of the public record. This research was funded and conducted under the Everglades Systems Assessment Section of the South Florida Water Management District. Commercial Peat Bags. 5 cubic ft. Lambert Lambert Canadian Sphagnum Peat Moss (6649801115) Product description: Lambert peat moss is an excellent soil amendment because of its capacity to retain water, aerate the soil and it is completely natural. All of Lambert's peat moss packages carry the OMRI (Organic Material Review Institute) logo, which indicates that they are approved for use in organic production. Size: 5.5 cu.ft. PVC Pipe: 1/2 in schedule 40 JM Eagle Model # 67447 Any manufacturer or supplier will do. Duct Tape, 1-7/8 in x 12 yds MSC Industrial Supply Gorilla Heavy-Duty Duct Tape, Model # 60012 Any manufacturer or supplier will do. Metal Rod (Rebar 1.3 cm diameter, 1.2 m long) Weyerhaeuser Model # 35616 Any manufacturer or supplier will do. Box Cutter Stanley Model # STHT10273 Any manufacturer or supplier will do. Work Gloves Firm Grip Model # 3101-96 Any manufacturer or supplier will do. Trash Bags (42 gallon) HUSKY Model # HK42WC050B Any manufacturer or supplier will do. Tree Islands of the Everglades. Sklar, F. H., van der Valk, A. G. Kluwer Academic Press. Dordrecht, The Netherlands. (2002). Wetzel, P. R., et al. Maintaining tree islands in the Florida Everglades: nutrient redistribution is the key. Front Ecol Environ. 3, (7), 370-376 (2005). Aich, S., Ewe, S. M. L., Gu, B., Dreschel, T. W. An evaluation of peat loss from an Everglades tree island, Florida, USA. Mires and Peat. 14, (2014), 1-15 (2014). Dreschel, T. W., Cline, E. A., Hill, S. D. Everglades tree island restoration: testing a simple tree planting technique patterned after a natural process. Restor Ecol. (2017). Stanturf, J. A., Conner, W. H., Gardiner, E. S., Schweitzer, C. J., Ezell, A. W. Recognizing and Overcoming Difficult Site Conditions for Afforestation of Bottomland Hardwoods. Ecol Restor. 22, (3), 183-193 (2004). Sharitz, R., Barton, C. D., DeSteven, D. Tree Plantings in Depression Wetland Restorations Show Mixed Success (South Carolina). Ecol Restor. 24, (2), 114-115 (2006). Brandt, L. A., Portier, K. M., Kitchens, W. M. Patterns of Change in Tree Islands in Arthur R. Marshall Loxahatchee National Wildlife Refuge from 1950-1991. Wetlands. 20, (1), 1-14 (2000). Armentano, T. V., Jones, D. T., Ross, M. S., Gamble, B. W. Vegetation pattern and process in tree islands of the southern Everglades and adjacent areas. Tree Islands of the Everglades. Sklar, F. H., van der Valk, A. G. Kluwer Academic Publishers. Dordrecht, Netherlands. 225-281 (2002). Jones, D. T., Sah, J. P., Ross, M. S., Oberbauer, S. F., Hwang, B., Jayachandran, K. Growth and physiological responses of twelve tree species common in Everglades tree islands to simulated hydrologic regimes. Wetlands. 26, (3), 830-844 (2006). Stoffella, S. L., et al. Survival and growth responses of eight Everglades tree species along an experimental hydrological gradient on two tree island types. Appl Veg Sci. 13, (4), 439-449 (2010). Aich, S., Dreschel, T. W., Cline, E., Sklar, F. The development of a geographic information system (GIS) to document research in an Everglades physical Model. J Environ Sci Eng. 5, (2011), 289-302 (2011). Weinbaum, S. A., Johnson, R. S., DeJong, T. M. Causes and Consequences of Overfertilization in Orchards. HortTechnology. 2, (1), 112-121 (1992).